Holiday dietary overload begins with the first candy corn on Halloween and ends (if you’re lucky) with the last glass of champagne on New Year’s Eve. Between office parties and family entertaining, it’s a wonder your bathrobe still fits by Jan. 2. But seriously, who can say no to Aunt Gertie’s apple pie or Grandma Rosa’s lasagna — it’s tradition, right? Tradition or not, you don’t have to plump up this holiday season. 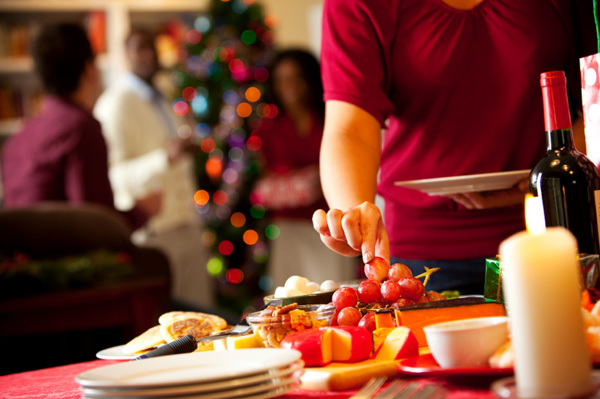 Here are some holiday diet tips to help you beat the holiday battle of the bulge. Think you don’t eat that much over the holidays? Consider this: The average person consumes 3,000 calories on Thanksgiving Day; that’s equivalent to 11 Carl’s Jr. hamburgers. You would have to run four straight hours, play tennis for six hours or walk 12 hours to burn it all off. And that’s just one day. Surprisingly, however, Americans gain only about one pound between Thanksgiving and New Year’s, according to a study by the National Institutes of Health. In addition, less than 10 percent gain more than four pounds, although many people believe they gain much more weight than they actually do. The bad news: That single pound stays around like annoying in-laws until the next holiday season, when it is joined by the new 16-ounce arrival. Over time, those single pounds add up to an unhealthy, unattractive fat roll. Hello, New Year’s resolutions. Taking a proactive approach to holiday weight gain is infinitely easier than trying to get it off once it makes its home around your waistline. So follow these tips for the best holiday gift you can give yourself: a healthy post-holiday body. Do not starve yourself all day so you can “eat whatever you want” at the evening’s holiday buffet. Fried hors d’oeuvres and bacon-wrapped shrimp add up quickly. Eat moderately during the day and have a piece of fruit to fill you up beforehand. Position yourself far from the buffet table to avoid absentminded munching while socializing. If it’s a bring-your-own party, bring your own plate of something healthy. Whip up a colorful, low-fat spinach dip or spicy salsa with baked pita chips, for example. Limit alcohol intake: Not only is alcohol a potent appetite stimulant, but it drastically reduces your body’s fat-burning abilities for hours afterwards. If you do drink, avoid high-calorie mixed drinks and stick with wine or champagne instead. Four ounces of champagne contains 70 calories compared with 200 calories for a whiskey sour or a 340 calories for a margarita. Think protein and crudités: fill your plate with leafy salad greens and vegetables, and top it off with shrimp, turkey, low-fat cheese or other lean protein. Don’t overreact to overindulging: The “I blew it, so I might as well keep eating …” mentality is self-defeating. One splurge won’t undo a week of healthy eating — unless you let it. If you do overeat or overdrink, just get back on track as soon as possible, and add extra exercise to the follow-up plan to help you feel and look better as you burn off the excess calories. With all the parties and dinners during the holidays, sticking to your diet can be a daunting challenge. But it’s possible to survive the holidays without starving yourself.